The Israeli government has issued orders expropriating Palestinian land near the illegal settlement of Halamish, northwest of Ramallah, a local activist said on Monday. 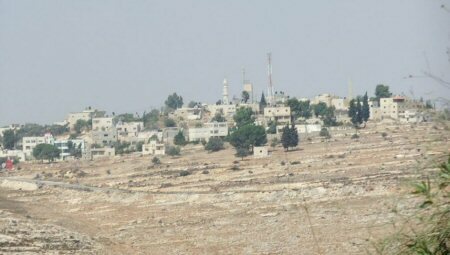 Mohammad Tamimi, from the anti-settlements committee, told WAFA that farmers from the village of Nabi Saleh were surprised to find out when they went to their lands to harvest olives that the army would not let them enter it, and ordered them to go back. He said that the soldiers passed on notices to the farmers informing them that their land will be confiscated “for security reasons,” the excuse Israel always uses to justify illegal acts. Tamimi says the land seizure is clearly intended to expand the settlement of Halamish, which has been growing in area at the expense of area Palestinian villages ever since three Israeli settlers were killed in that settlement by a Palestinian attacker few months ago. He said the anti-settlements committee is going to contest this order.